English. Spanish. German. French. Italian. Japanese. Dutch. Mandarin. Portuguese. Korean. and Russian. Swim or Watch the Escapees attempt to swim from the island offshore of the yellow warnings sign. The Swim will be support by Vessel Hyperfish and kayaks. 5-10 Swimmers 1 Rigid-hulled Inflatable Safety Boat will be included. 11-26 Swimmers 2 Rigid-hulled Inflatable Safety Boat will be included. Plan out your private swim event and give us a call. We can support you crossing the channel Safely. SF Boat Support been supporting swims since 2010. We worked very close with coast guard and big swim events like Escaped from Alcatraz, Shark Fest, Bridge to Bridge, Bridge to Baker Beach and many more. 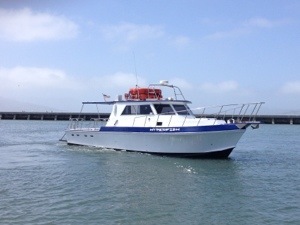 SF Boat Support can custom cater to your personalize group event. Please Call To Book Your Group Event With Us!